Press conference at Mineola Station. Westbury, NY - October 22, 2015 - An estimated 40,000 Long Island Rail Road customers could face considerable delays over the weekend of Saturday, October 24 and Sunday, October 25 when the Railroad suspends train service on the Main Line between Hicksville and Mineola for the installation of a new bridge in Westbury. The new bridge is part of a $17.5 million project that improves safety for railroad customers as well as the motorists and pedestrians who use the span. The project includes a new roadway, sidewalks, curbs, fencing and paving – all financed by the MTA Capital Program. The bridge is scheduled to open for vehicular traffic in April 2016 and all construction should be completed by June 2016. Buses replace trains between Hicksville and Mineola. Bethpage customers will be bused between Mineola and Hicksville. Ronkonkoma through Farmingdale customers will travel to and from Penn Station by train without transfers, as trains will be diverted via the Central & Babylon Branches. Buses replace trains between Hicksville and Mineola for the entire weekend. Trains between Huntington and Port Jefferson will operate every two hours. Service between Huntington and Penn Station will operate hourly. Carle Place and Westbury will be served by buses only. In addition to the bridge work, the LIRR will take advantage of the 48-hour train service suspension by performing other critical work in the vicinity during the outage. These additional efforts will include track work and drainage improvements between Mineola and Hicksville and replacement of the 12th St. crossing in New Hyde Park. To accommodate the grade crossing improvement work, vehicular traffic will be diverted from 12th Street to Covert Avenue and New Hyde Park Road for the entire weekend. A reminder that during the construction of the new Ellison Avenue Bridge, only local traffic is allowed on Ellison Ave. Other vehicles must detour to Post Ave. and Cherry Lane in Westbury. The Town of Oyster Bay parking lot on the north side of Hicksville Station will be closed on Saturday, October 24 and Sunday, October 25 to accommodate buses transporting customers between Hicksville and Mineola. Parking will be available in the Town parking garage just east of Hicksville Station. The LIRR has also printed a special brochure “Ellison Avenue Bridge Installation,” which follows this press release, details the project and includes some helpful maps. The latest information on LIRR service is available at www.mta.info/lirr or by signing up for free customer service alerts via email or text here. Customers may also call 511, the New York State Travel Information line, and say: Long Island Rail Road to reach a customer service representative. If you are deaf or hard of hearing, use your relay service provider or the free 711 relay to reach LIRR at 511. Bring Out Your Child's Patriotic Side: Kid-Friendly Events Happening 4th of July Weekend! 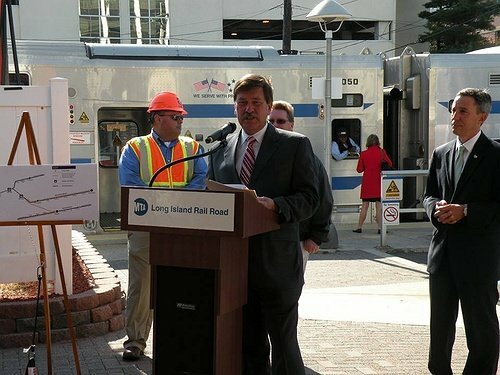 Subject: LongIsland.com - Your Name sent you Article details of "40,000 Customers Facing Delays This Weekend, Oct. 24-25, as LIRR Installs a New Bridge in Westbury"